The Toledo Swiss Singers are looking for singers and Sept. 9 is the perfect time to see what we're all about. The Singers practice Wednesday evenings at 7:30 at Oak Shade Grove, 3624 Seaman Road in Oregon, from September to May. Our open house is Sept. 9. If you are thinking of stopping by or would like information, please let us know via email: toledoswiss@gmail.com. 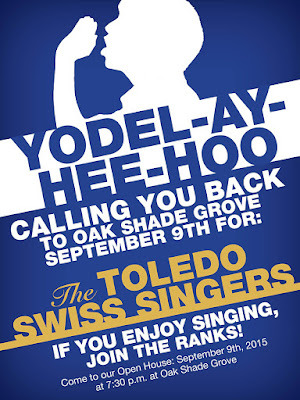 Under the direction of Micah Graber, the choir has been a cultural staple in the Toledo area since 1869 — that’s 146 years of celebrating Swiss culture in the area. Starting first as a men’s choir, the chorus in its current form has been around since 1924. Its aim is to retain and preserve the culture and songs of Switzerland, to live up to the singers’ ancestors’ tenets of faith and behavior, help others, and to be good citizens. The Singers, one of the area’s oldest singing groups, perform three concerts annually, including a wide variety of traditional Swiss, Broadway, Gospel and American music. The non-profit organization is also part of the larger German American Festival (GAF) Society, which most people associate with the festival held annually in August. The society consists of seven German-speaking societies. During the festival, the Singers set up and operate the Swiss Cheese Haus, along with the Stein Stossen contest. The GAF Festival draws more than 30,000 people on an average weekend and is the largest ethnic festival in this part of the country. 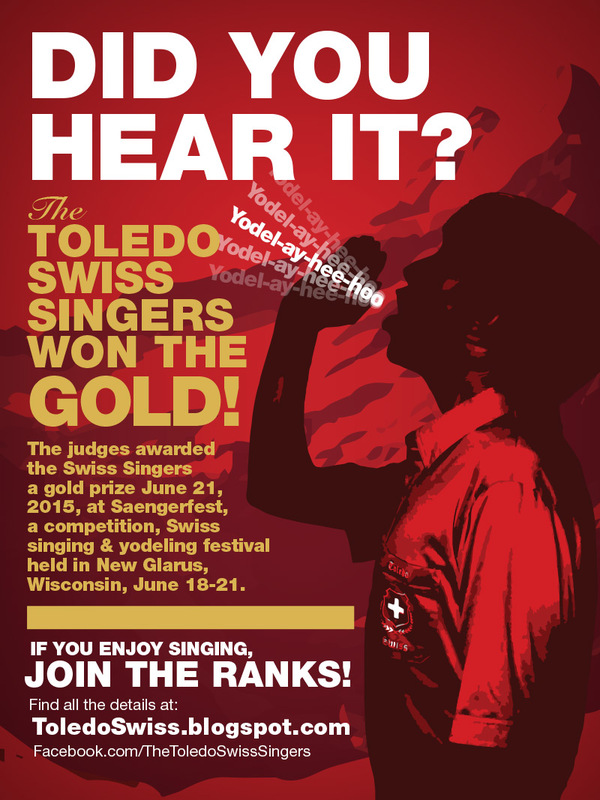 The group was awarded a gold prize in June at Saengerfest, a competition, Swiss singing and yodeling festival held in New Glarus, Wisconsin, June 18-21. The Singers were presented with the special wreath for their mixed-choir German prize song “Waldeinsamkeit” by F. Abi. Ladies from the group were presented with a silver prize for their singing of the French song “Marine” by J. Mamie. The Singers compete internationally every three years as part of the North American Swiss Singing Alliance (NASSA), made up of 14 choirs from Canada and the U.S. The Singers presented their two competition songs June 19 and sang in a “grand concert” June 20 with 300 singers from all of the choirs, including special choirs from Switzerland. One of the groups was from Glarus, Switzerland, a sister city of New Glarus. After accepting the gold and silver prizes, the Singers made a special announcement that they would be hosting the next Saengerfest in 2018. Toledo has hosted five Saengerfests: 1901, 1924, 1962, 1982, and 2006.